One tradition I’ve upheld on this blog ever since I began is that every year, on my birthday, I dedicate a post to someone from the world of cinema who shares my birthday. This year, therefore, a post in honour of José Ferrer, the Puerto Rican actor who was born on January 8, 1912, and became the first Hispanic actor to win an Oscar for Best Actor (for Cyrano de Bergerac). I confess I haven’t seen too many of Mr Ferrer’s films, but Moulin Rouge (in which he played the tormented artist, Henri de Toulouse-Lautrec) impressed me immensely. As did this one, a thought-provoking tale of an unforgivable miscarriage of justice. Besides starring in I Accuse!, José Ferrer also directed the film. This is a retelling of the infamous Dreyfus Affair, which shook France in the late 1890s and had consequences as varied and far-reaching as Émile Zola’s hard-hitting “J’Accuse!” letter, to the establishment of the Tour de la France. The film opens at the German embassy in Paris. A uniformed visitor arrives, wishing to meet the Military Attaché. Shown into the attaché’s office, this man (Anton Walbrook) introduces himself as Major Esterhazy, an officer of the General Staff of the French military. He gets down to business very quickly, only stopping to give a brief preamble: he is hard up and needs money. And he has something to offer the Germans: French military secrets. The attaché is reserved, even somewhat contemptuous in his refusal of Esterhazy’s offer. But the suave and very confident Esterhazy has come armed to counter any refusals; he has brought with him a list of all the secrets—documents, designs, plans, etc—which he can share with the Germans. Before leaving, Esterhazy leaves his address with the attaché, saying that he looks forward to a long and fruitful association. There is a brief but important spell at the end of the scene, after Esterhazy and the German have left the room. An old cleaning woman comes into the office, and begins to do the dusting. When her work brings her next to the wastepaper basket, she looks towards the ajar door to make sure no-one’s watching, then dips a hand into the basket and pockets the waste paper she finds lying in it. The story now moves to the General Staff. It’s morning, and Captain Alfred Dreyfus (José Ferrer) has just entered. Within the first couple of minutes, the film establishes Dreyfus’s character, as he checks his watch against the bells ringing the hour nearby; as he goes into his office, fixes nibs in his pens, places the pens carefully against two separate inkwells, aligns a stamp that’s a little crooked, and takes out a set of portraits—of his wife and two children—which he places on the desk. This is a man, obviously, who’s very precise, organised, and punctual. This impression—and that Dreyfus is a dedicated officer—is reinforced when his boss, Major Picquart (Leo Genn) calls for a report, and is surprised to learn that Dreyfus has already completed it. It emerges that Dreyfus often stays back after the other officers have left for the day. It also emerges, from the conversation (and the distinctly snide remarks of the other officers as they pass by) that Dreyfus is a Jew—the first to be inducted into the General Staff. And that it was Major Picquart who recommended him for the post. While Picquart (as one would expect) approves of Dreyfus, there’s more than a hint of anti-Semitism in the behaviour of the other men. Soon after, all the officers of the General Staff are summoned to be addressed by the Minister of War, General Mercier (Donald Wolfit). To the gathered officers, General Mercier announces that Colonel Sandherr (George Coulouris) of Counter-Espionage has something to say to them. Sandherr’s announcement is only slightly longer than Mercier’s. He says that it has been discovered that some vital plans have been leaked to the Germans—in fact, the leak has been going on for some months now. They do not know who it is yet, but it’s obvious that it is one of these men assembled in this hall. Does anybody have any clue to the spy’s identity? Nobody speaks up. Sandherr vows that he will get to the bottom of this. Should anyone discover anything, they are to report it at once. One evening, Dreyfus is again working late at office, when Esterhazy (who does not know Dreyfus) happens to come by. Esterhazy is looking for Major Henry (Harry Andrews) of the Statistical Section. Dreyfus, who’s about to close up his office, offers to show Esterhazy to Henry’s office. Henry, after welcoming Esterhazy, persuades both him and Dreyfus to have a drink in his office. As they drink and chat (and Dreyfus politely but firmly turns down Esterhazy’s offer to go savouring the fleshpots of Paris), Henry mentions the spy to Esterhazy, and explains that they are now close to finding out who the man is. Some evidence has come to hand: a French secret agent working at the German embassy has found an incriminating letter that they will soon be able to trace to its source. “Yes. It seems we have a lot of officers nowadays who were originally something else,” Sandherr says. He’s looking pointedly at Dreyfus as he finishes speaking. The French-born Jew is obviously, in Sandherr’s eyes, more of an outsider than the Hungarian-born Esterhazy. Sandherr goes into his office, Esterhazy and Dreyfus go their respective ways, and Henry takes the roster to Sandherr. Sandherr and Henry now examine a letter—crumpled, as a result of having being consigned to a wastepaper basket from which it was retrieved. This, it transpires, had been sent to someone at the German embassy. It contains a reference to a French spy, an officer named only as D in the letter, and who is referred to as having been in the artillery. Sandherr comes to a very swift, very biased conclusion: it has to be Dreyfus. Dreyfus, who was in the artillery. Dreyfus, who is an outsider. A wealthy man, and where has all that wealth come from? Most of all, Dreyfus the outsider. He immediately orders Henry to summon Major DuPaty de Clam (one of my favourite screen villains, Herbert Lom). DuPaty de Clam is their handwriting expert, and will be able to tell definitely whether or not the handwriting in the letter is Dreyfus’s. Dreyfus, totally unaware of the disaster that threatens, has gone home in the meantime. Here we see another side of the rather reserved and almost automaton-like man he is in office. At home, Dreyfus is an adoring husband to Lucie (Viveca Lindfors), an affectionate father to his infant daughter and his little son Pierre (who is army-mad, to the extent of having his own little uniform and wooden sword). This evening, the Dreyfus household is also playing host to Dreyfus’s brother Mathieu (David Farrar), who is visiting Paris on business. …totally unaware that their lives are about to fall apart. The next morning, at the office of Colonel Sandherr, Major DuPaty de Clam arrives, and examines the incriminating letter. Sandherr summons Dreyfus’s boss, Major Picquart, and confronts him with the news that Dreyfus is almost certainly a traitor. In the minds of both Sandherr and DuPaty de Clam, Dreyfus is already condemned. Picquart, however, refuses to believe any such thing. There is a brief run-in between Sandherr and Picquart. While Picquart concedes that it looks suspicious, he does not agree that Dreyfus is guilty of treachery. To establish the truth of the matter, Dreyfus is summoned. DuPaty de Clam has bandaged his own hand, and cites an injury as his reason for being unable to write; will Dreyfus write a letter on his behalf? He will dictate. He does so—dictating the very letter that was discovered and is now the only piece of evidence they have. An increasingly puzzled Dreyfus is wondering what this is all about when DuPaty de Clam takes the letter from him, quickly (too quickly) compares the handwriting on the letter he holds, and announces that he is arresting Dreyfus on the charge of high treason. After that, things move very rapidly. Major Picquart seems to be the only officer who believes in Dreyfus’s innocence. …but the real culprit, Esterhazy, happens to discover (through Major Henry) that the ‘spy’ has been caught and arrested. When he finds out the name of the ‘traitor’, Esterhazy—seeing that here’s a chance for him to line his pockets—goes to a newspaperman with the news, in exchange for money. The next day, the news is all over the city. Lucie finds herself shunned (even by her housemaid, who gives notice), and both she and Mathieu look about frantically for someone to plead the case of Alfred Dreyfus. They do find a lawyer, Demange (Felix Aylmer), who seems wise and competent (and, most importantly, convinced of Dreyfus’s innocence). But the problem is that by now, because all of France knows about this allegation, it has become a question of honour. General Mercier, Colonel Sandherr, Major DuPaty de Clam: all of these powerful, influential men (at least with reference to this case) have categorically stated that Dreyfus is guilty. And they will go to any lengths to prove it. The resultant court martial is a travesty of a trial. The prosecution rests its case on one single piece of evidence: the letter—and even the sample in Dreyfus’s handwriting bears only some similarities to it (which DuPaty de Clam summarily dismisses as being Dreyfus’s deliberate attempt to disguise his writing). Despite that, despite Major Picquart’s attempts to stress on Dreyfus’s dedication and hitherto commendable record—the defence is completely and brutally overruled. 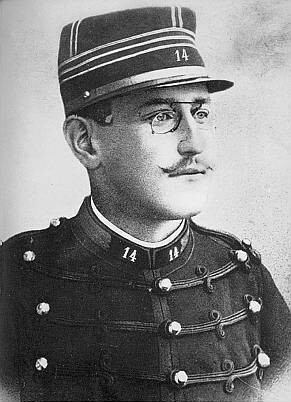 Captain Alfred Dreyfus is given an option: if he admits to his guilt, there will be an appeal for leniency and he can hope to be exiled to some pleasant place in the colonies. If he refuses to confess, it’s the Devil’s Island (in French Guiana) for him. Dreyfus continues to insist that he is innocent, and even shouts it out, again and again, as he is ceremonially and publicly divested of his colours, his rank, the ribbons on his cap, his sword (which is broken in two). He is sent off, far, far away, to Devil’s Island. To solitary confinement, where even the guards say nothing to him, until Dreyfus begins to wonder whether he’s gone deaf. Or gone mad. Or both. The Dreyfus case is closed. An innocent man has been sent to a living death. And the world has forgotten, has moved on. All except Lucie, Mathieu, and Major Picquart—and what can they possibly do? I had first read The Dreyfus Affair when I was barely in my teens, and not really keen on real-life stories—least of all anything with a whiff of politics in it. Despite that, the account gripped me and left me shaken with its depiction of gross injustice. This film, one of the later cinematic adaptations of the original case (the first version was a French one from 1899), was an engrossing and fast-paced film that I liked a lot. Instead of focussing only on the case as it proceeds in the courtroom, the film brings in other aspects, more personal aspects, of the story. For instance, Dreyfus’s relationships with people: with his wife and family, Mathieu, Major Picquart, even his brother officers. Gradually, as the film progresses, it becomes clear that there’s a reason why Dreyfus is a reserved and almost brusque officer, but a warm and affectionate man at home. Or why he stays back at office frequently to finish work… all because he’s acutely aware of the fact that his colleagues look down on him because of his religion. Their contempt is what has made him put up barriers around his professional self, and his need to prove himself as good as them (or better) is what drives him. Then, there are the ironic symbols that pop up now and then. The film begins and ends with a shot of the French national motto: Liberty, Equality, Fraternity—and one can’t help but marvel at how the Dreyfus Affair dragged those three ideals through the mud and grime of politics and ego. The crucified Christ. I don’t know if that is (or was) the norm in French courts of law. Regardless, it’s a sad reflection of an innocent being made to pay for the sins of others. And, ironically, an innocent who is not a Christian, but a Jew. The somewhat cardboard-cutout one-dimensional characters of the ‘bad men’: Mercier, Sandherr, and DuPaty de Clam, in particular. I won’t go on cribbing about that, though, because it may well be that the real men were as vile as they’re shown onscreen. While I was watching I Accuse!, I kept thinking of Paths of Glory, which has certain similarities to this film. Both are about the French military; both are about innocent men who are made scapegoats so that the more powerful do not lose face. Both are, in their own way, about personal beliefs and principles versus what we must (or mustn’t) do. I Accuse! is not a Paths of Glory—it is less subtle, and eventually, less depressing too. But it is a fine film, and a fine showcase of José Ferrer, director and actor. Interesting film, Will look out for it. Thanks for the review. The title sounded like it had something to do with ‘I confess’ (Alfred Hitchcock) , like a spoof. Yes, at first glance, I too had thought this sounded uncannily like a prequel to I Confess, but when I read the synopsis, I realised that it wasn’t. Now I must get around to watching I Confess – I confess I haven’t seen that yet, despite being such a die-hard Hitchcock fan! Happy Birthday to you and happy birthday to José Ferrer! I read about Dreyfuss affair, I think, in the Illustrated Weekly of India and I was shocked! I would love to see this film sometime and at least I am going to go to wiki and read more about it. France being a secular country, even during those times, I doubt that the picture of Christ would hang in the court of justice. BTW, I didn’t understand what you menat by: (the first version was a French one from 1899). Wonderful review madhu! Have a wonderful birthday! I take my words of secular France back. The law separating the church from the state was passed in 1905. Ah, okay. Even if the church and state were tied together at the time, I find it a little odd that a painting of the crucifixion should have hung in a courtroom. A plain cross, perhaps. Still, that’s just my perspective. Who knows, this might actually have been the case. Maybe it was symbolic to show the presence of the catholic church behind the proceedings or to show the similarity between the two cases. Both Jews, both accused falsely with no strong incriminatory evidence! True. But then Jesus might have been born a Jew, but he wasn’t, eventually… to me, the crucifix in the courtroom seemed symbolic of an innocent man being punished without ‘strong incriminatory evidence’, as you say – but the idea of the presence of the Catholic church (which, of course, was a good part of the reason why a Jew like Dreyfus was accused) makes a lot of sense. I remember I had read about the Dreyfus Affair in a collection of condensed books that Reader’s Digest had published back in the 60s or 70s (I think). My parents still have the book. When I wrote that the first version was a French one from 1899, I meant that multiple cinematic adaptations of the Dreyfus affair have been made over the years, both in English and French (possibly other languages too, but I don’t know). The first cinematic adaptation was a French one that was made in 1899, which must have been pretty different, because Dreyfus was only exonerated in 1906 or so. As early as 1899! Wow, the film making was still in the infancy at that time. It would make an interesting dekho! Yes, I’d like to see it too, especially to see what perspective they had on the case at that time – was the film pro-Dreyfus? Or did the film maker believe Dreyfus guilty? I remember reading about the Drefuss Affair when I was a youngling. I watched the film not much later, and was so caught up in the proceedings. It truly was France’s moment of national shame. Thank you for the detailed review. Yes, this was such a shameful incident, wasn’t it? Horrifying. An odd coincidence: I spent most of last week doing research into the Jews of Strasbourg, for an article I’m writing for submission. And at the end of the week, I watched I Acccuse! – and it turns out Dreyfus was a Jew from Alsace! Creepy, that. Thank you, Shilpi, for the appreciation! I’m glad you liked this review. It’s a good film, and very well worth watching. And yes, the case (and therefore the film) did end happily. Esterhazy confessed, and Dreyfus was finally not just exonerated but also promoted and bestowed military honours. Ironically enough, of all the officers involved in the case, he was the only one who went on to serve in World War I. He died in 1935, and a statue of his still stands in Paris. So yes, justice did prevail. Thank goodness. Happy Birthday to you! Very best wishes to you and yours. And thanks for this review… I definitely want to watch this. Thank you, DG. Yes, do watch this film – it’s a very good one! How every one in the film industry would wish that their birthday falls on 8th of January! Happy belated birthday, Dustedoff! :D I am jealous, you have the same birthday as ELVIS PRESLEY and Nanda! Well, I have the same birthday as Michael Jackson and Shailendra’s on August 30, but still! Shailendra, ah, yes. :-) Michael Jackson – well, I will reserve my opinion on that. You know, today in school they were discussing Elvis Presley for some reason and I was just reminded of Shammi, and someone said – “Hey, you know, she likes Elvis.” Everyone turns to me, and I do what I don’t want to do – I BLUSHED. Oh my goodness. Now I keep getting teased over it! P.S. What do you think of the story on my blog? I read the discussion about the cross in the courtroom with interest, and here (http://charente-maritime.fr/CG17/jcms/cg17_84508/les-archives-s-exposent-au-site-de-la-rochelle) you have a picture of a courtroom before and after the law of separation of Church and state in 1905. The cross is there. You’re right of course to say that the film-maker must have thought about the similarity of the two jews, Jesus on the cross and Dreyfus unjustly condemned. Back at the end of the XIXth century, French catholicism was still quite influenced by a pervasive and “normal” anti-jewish feeling, which came from an age-old defiance of the “deicide people” which the Christians thought they had a right to accuse on the basis of Matthew 27,25 or Acts 5,28 among other passages. I think it was only the 2nd Council of the Vatican which asked for the prayer containing the words above to be expurged (see http://en.wikipedia.org/wiki/Jewish_deicide). Yves, thank you so much for coming along and clarifying this for us. I was puzzled about the cross in the courtroom, but yes – that photograph on the page is clear enough. That link to the page on Jewish deicide is interesting, too. I must admit I’d never heard of this… we live and learn, everyday. Interestingly, around the same time that I watched this film and wrote up this review, I was also researching an article on foie gras in Strasbourg, and discovered that Strasbourg has the largest population of Jews in France – and that the Jewish tradition has a lot to do with foie gras. Well, that’s news for me Jews, Strasbourg and foie gras! And I was doing this review of Ritwick Ghatak’s The cloud-capped star, and noticed that the father in the film (I don’t know if you’ve seen it) exclaims “I accuse” at one stage, in a gesture that’s got to be reminiscent of Zola’s denounciation in 1898. He accuses the whole state of affairs that led to the stricken poverty of 1947 Bengal. That’s interesting – I must finish reading your review, actually. I’d begun it, but got called away in the middle. Thanks for reminding me of it!